Sorry, we are currently sold out of 'El Salvador Finca Kilimanjaro Burundi Process'. Please check back later. We purchased this coffee in three different preparations: Traditional washed, full natural and this an unusual Burundian style double soaked. Each has its followers. Some of the folks in our roasting department love this version best because it has slightly less acidity than the traditional washed version. It is still but has additional textural elements. This is a highly sought after coffee from El Salvador Finca Kilimanjaro, custom processed to order, this is the Burundi style processed version of this special coffee. We have been trying to form a direct trade relationship with Aida Batlle (pronounced Bot-lay) for several years but all of her coffee had been spoken for. As we got to know one another and as the production from her signature Kilimanjaro farm slightly expanded, we finally were able to acquire this wonderful coffee and take advantage of the custom preparation that she offers. 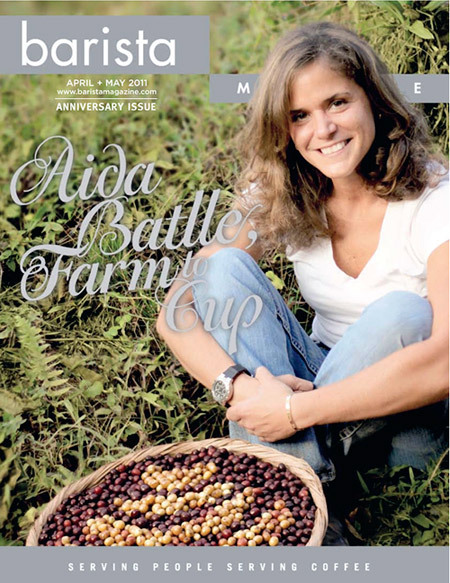 Aida Batlle has made quite a name for herself in the specialty coffee industry in recent years and this coffee is a testament to her glowing reputation. Aida is a fifth-generation coffee farmer who, while she is native to Miami, produces some of the world's best coffee on the slopes of the Santa Ana volcano in Western El Salvador. Her approach, when it comes to coffee, is as unique as the cherry she produces. She questions why there can be hundreds of types of wines but when it comes to coffee the playing field is too narrow; thus, she urges consumers to understand that all coffees taste different and they should be acknowledged for their individual characteristics as with different wine or whiskey. The story behind her farm is a special one that pulled her back to her Salvadoran roots a little more than a decade ago. With constant threat to life and land the Batlle family took refuge in Miami during the Salvadoran civil war which ranged from 1980 to 1992. Roll the clock forward. After settling down in Nashville at the age of 28 she felt she would instead be more helpful to her father, Mauricio, who was now back on his coffee farm in El Salvador struggling to make ends meet amidst a plummeting coffee market. In 2002 she arrived in Santa Ana to reevaluate her family's coffee farm and unearth the hidden potential she knew it had due to ideal conditions such as volcanic soil and high altitude. When Aida arrived her father had been selling his harvest to the local mill, a very common practice among farmers. His coffee was mixed with lots from nearby farms and sold as a generic Salvadoran blend. Shortly after her return to her native country her father gave her control of the farm and she set out to improve each facet of production. Her perspective was unique as she came from the United States where there is a premium placed on quality produce and other food items. Aida took this mentality and translated it into her work on the coffee farm, but not without skepticism from farm managers who were not keen on implementing new quality practices under the authority of a novice, female producer. Eventually the farm management embraced her new standards for quality and respected the amount of time and nurturing that Aida put into harvesting only the ripest, deeply red colored coffee cherries. Her technique was a stark contrast to the centuries old practice to pick coffee whether or not ripe or healthy, just to have a larger harvest and ignoring the quality of each individual cherry before adding it to the pile. In 2003 Aida's coffee had its first shot at the spotlight when she entered coffee from Finca Kilimanjaro in the inaugural Cup of Excellence competition in El Salvador. Judges at the competition noted that the coffee had great flavor, brightness, and balance and they awarded it the 1st Place coffee of the competition, putting her farm on the international map for the first time, but certainly not the last. After the CoE competition Aida's incredibly high standards were not seen with skepticism but rather with respect and eagerness to produce quality coffee from there on out. Coffee that has been approved by her standards is deemed "Aida Batlle Selection" and cannot wear this stamp if it is not of the utmost quality. Finca Kilimanjaro is mainly Bourbon varietal which came to El Salvador more than a century ago, acquired from Guatemala by the then governor of Santa Ana Province, and who just happened to be Aida Batlle's great-great-grandfather. Aida has taken coffee to a new level since it was first introduced by her family and is renowned in the coffee world for her intricate level of detail and processing. She is known for experimenting with processing methods, creating a unique and highly customized coffee for the consumer. Much of her success can be attributed to her cultural diversity paired with her agricultural ideals that had been otherwise unseen prior to her introduction to the coffee scene. Aida has a keen understanding of what makes quality coffee from cherry to beverage and she utilizes her knowledge every step of the way. This concept was summarized quite perfectly by an article in The New Yorker Magazine that stated, "In an industry where farmers and connoisseurs have often been kept apart, Batlle is both - she's a producer who speaks fluent customer." Burundi Process: meaning the beans are processed using methods native to Burundi. There is an initial 24 hour dry fermentation with washing every 12 hours. This step entails adding a small amount of fresh water and turning the coffee beans with a wooden paddle. Next step is a 24 hour under water fermentation, again washing every 12 hours. The third step is a return to the dry fermentation tank, again with the addition of a small amount of water for 24 hours with in between washing. Finally the coffee is spread on drying beds, turned and dried to a predetermined moisture level. Cup Characteristics: The double soaking from processing gives this coffee an enhanced flavor profile. Milk chocolate creaminess with a tart, lemon finish. Roasting Notes: Burundian double soak coffee roasts like washed and has less chaff then natural process. These are high grown coffees so very hard and dense. This coffee can be roasted throughout a the full range but comes into its own as second crack is just starting. Bring it strongly to first crack then cut down the heat significantly for slow development between cracks.